A Brief History Of ‘The Wave’: Nationals Fans Want To Kill It, But Is It Too Ornery To Die? The Wave turns 32 years old this October, and while that seems far too young to die for you and me, a group of Washington Nationals fans thinks its demise is long overdue. Is it time to turn out the lights and end the party for The Wave? First, some background. The controversy over The Wave extends to its very origin, with at least two sources claiming that they invented it. Football fans at the University of Washington conducted the first known example of The Wave at a football game on Oct. 31, 1981, and to this day claim to have been the first to popularize it. But now meet Krazy George Henderson, self-proclaimed "Sexiest cheerleader of all time" whose freelance rooting antics have taken him through NFL, MLB and college football stadiums throughout the nation over the past four decades. Krazy -- who once fought a lion at an MLS game and owns a black belt in judo -- claims that he invented The Wave at a San Jose State football game in 1979. He later perfected it, and introduced the first complete around-the-stadium wave on Oct. 15, 1981, during an American League Championship Series playoff game between the A's and Yankees at the Oakland Coliseum. "I can't believe they have the nerve to claim it," Henderson said. "I have 47,000 witnesses who were there at the Coliseum, and know the truth. The best part is that a year later, they were doing The Wave during a Monday Night Football Game, and Don Meredith mentioned that it was invented at the University of Washington. But Howard Cosell quickly corrected him. 'I hate to contradict you,' Howard said, 'But The Wave was actually invented at an Oakland A's-New York Yankees playoff game two weeks before." I was watching and almost fell out of my chair." So what's kept this phenomenon fed after all these years, when other sports fan memes -- The Macarena, anyone? Anyone? -- have fallen by the wayside? The answer is shrouded in mystery. My guess is because it's and easy, rather brainless distraction when the action on the field wanes -- which is why it's perfect for baseball. Of course you'd have difficulty starting The Wave at a Marlins game these days ... it would be pretty sparse. More like The Combover. Some find it so annoying that there have been attempts every now and then by individual teams to kill it off. 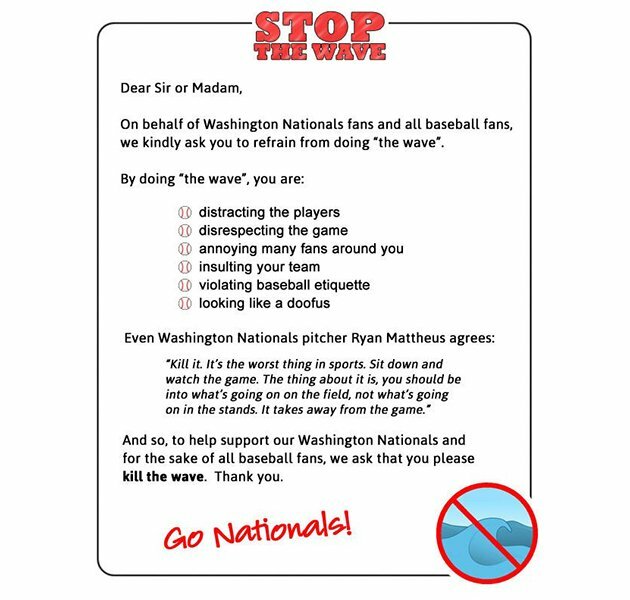 The latest is from the Washington Nationals, our actually their fans, who have spent some time and expense printing up the little flyer you see below. Will it work? My guess is, perhaps temporarily. But like the common cold and Barry Manilow, The Wave has resisted all of our attempts to eradicate it and now is part of our culture. Better to just learn to live with it.